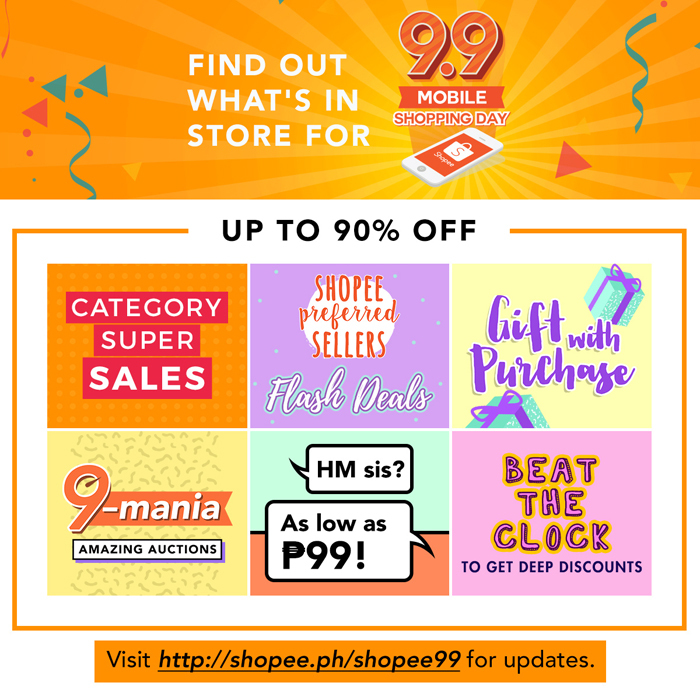 Shopee Celebrates Success with 9.9 Mobile Shopping Day! Shopee 9.9 Mobile Shopping Day licked off last September 1 with flash sales and social media contests, where shoppers can won prizes daily including ₱1,000 gift certificates and cameras. On September 9, Filipinos can enjoy even greater deals and promotions, including hourly flash sales, high-value bestsellers up for auction, and discounts up to 90% on selected items. Shopee has collaborated with thousands of sellers to offer exclusive deals for 9.9 Mobile Shopping Day. Since officially launching across Southeast Asia and Taiwan in December 2015, Shopee has experienced significant growth. Across all markets, Shopee has over 20 million installs, 250,000 daily orders, and an annualized gross merchandise value (GMV) of USD 1.3 billion, making it the fastest growing marketplace in the region. Shopee Philippines has amassed over 2 million installs to date and gained a six-fold increase in number of orders since the start of this year. Shopee Philippines can be downloaded for free on Google Play and App Store. For more information on Shopee 9.9 Mobile Shopping Day, visit shopee.ph/shopee99.